“Transition Zone” As shoppers enter the store they are faced with a mannequin display set against an open trellis. The trellis signifies the boundaries of the “Transition Zone”. Behavioral studies show that shoppers need a transition zone at the front of the store to shift from “walking mode” to “shopping mode”. “Art Piece Display Unit” Upon passing the “Transition Zone” shoppers can start browsing the select merchandise showcased in the multi-functional display unit. The display unit doubles as both a sculptural and a functional piece with multi level shelving for accessories & tops, hanging rods for clothing, and mirrors for shoppers’ convenience. “Plush Tufted Velvet” The Art Piece Display Unit is set against a backdrop of floating tufted red velvet walls backlit from behind. 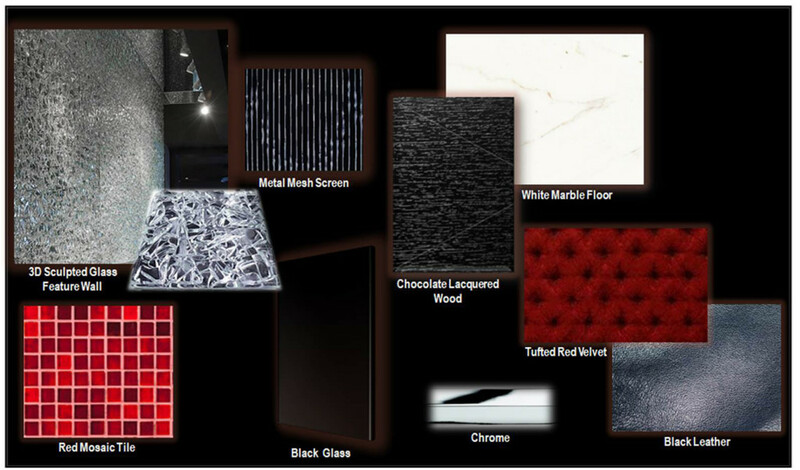 The red velvet not only adds some softness but also improves acoustical performance in the store. It also reinforces the idea that “jewels” (i.e. 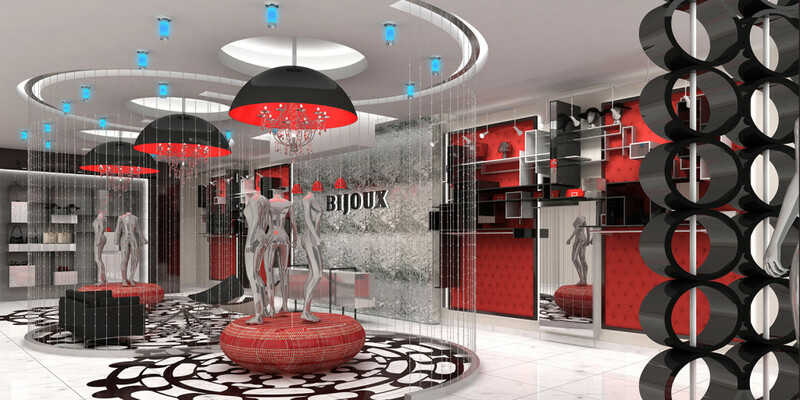 merchandise) are displayed and provides a luxurious feel to the store. “Accent Lighting” Various forms and scales of lighting are used throughout the store. Dramatic domes encompassing sparkling chandeliers are repeated in the Central Area. Surface mounted lighting sprinkled throughout provide a variation in color. Pendant & track lighting are used to highlight key areas. Cove and backlighting are also used to create drama. “Cubic Display Wall” Another artistic display element is located at the back of the store. This wall serves a dual purpose-on the one hand as a highlighted display area for merchandise, and on the other hand as a divider and a visual separator between the retail area and the fitting rooms and storage area beyond. “Branding Wall” The Branding wall is a bold statement located strategically in the center of the store opposite the “Central Zone” and is visible from the store entry. 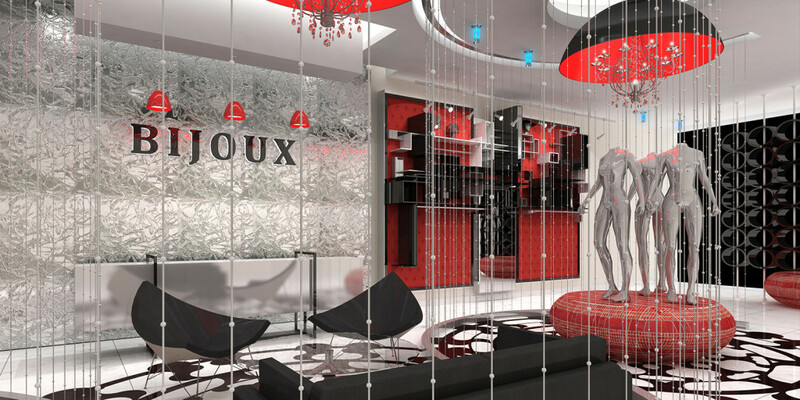 This feature wall is composed of the Bijoux sign set against a wall of shimmering three dimensional sculpted glass that sparkles like jewels (see materials page). 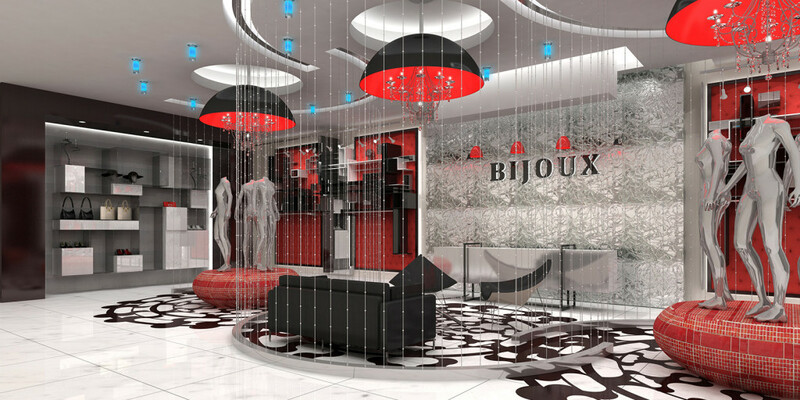 Accent lighting on the wall and pendant lighting dropped above the cashier counter completes the branding wall. “Seating Area” The seating area located centrally is anchored by the mesh screens and dome lighting. Studies show that people don’t feel comfortable sitting in open areas unless they are anchored or surrounded by sometime type of architectural element. Here, the mesh screens create a retreat for shoppers in direct view of the branding wall. © 2016 Reem Akkad Design. All Rights Reserved.